NOFX is a popular punk rock band from California. The band was formed in 1983 by Fat Mike. As of April 2009, NOFX has released eleven full-length albums. Their latest one, Coaster, came out on April 28, 2009. ↑ Strauss, Neil (18 May 2003). "MUSIC: PLAYLIST; Not Your Usual Load of Laundry" – via NYTimes.com. ↑ "Punk Band NOFX Blitzes Sympathetic Crowd". koreatimes. 17 April 2007. ↑ Farley, Christopher John (22 July 1996). "MUSIC: WHERE THE MOSHERS ARE" – via content.time.com. 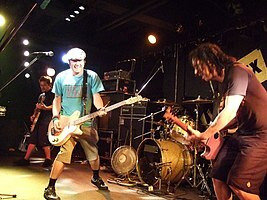 Wikimedia Commons has media related to NOFX.